This holiday season, I decided to try my hand at baking. Mind you, I don’t bake. Like I’ve mentioned before, my idea of baking is opening up a box and adding eggs and water. Wen I found the recipe for Eggnog Cookies, I was so excited to try it out. Sadly, that first recipe was not as tasty as I’d hope it to be. Luckily, the second recipe more than made up for the failure of the first. Since succeeding on that yummy batch I baked for my first cookie exchange, I’ve baked three more batches. And today, the kids and I just went passing out little red baggies tied with jingle bells and curly red ribbon full of yummy eggnog cookies to our neighbors. Combine the flour, baking powder, cinnamon and nutmeg. Mix well and set aside. Cream together the sugar and butter. Add eggnog, vanilla and egg yolks and beat until smooth. Drop by rounded teaspoonfuls onto ungreased baking sheets 1 inch apart. Sprinkle lightly with nutmeg. Bake for 23 to 25 minutes or until bottoms turn light brown. Transfer to cool, flat surface immediately with a spatula. 2013 recipe revision. I added an extra stick of butter, substituted the all purpose flour with whole wheat flour, and instead of sprinkling nutmeg at the end before baking, I mixed the nutmeg in 1/2 cup of powdered sugar, and rolled the finished cookies in the sugar after cooling. AMAZING!!! Posted on December 9, 2012 by MamaRupp	• This entry was posted in Uncategorized and tagged baking, cookies, Eggnog Cookies, holiday, recipe, yummy. Bookmark the permalink. Do you love cookies? Do you love Eggnog? Have you ever tasted an Eggnog Cookie? My husband says they taste like Christmas in your mouth. Every year, I anticipate the seasonal release of Eggnog on the grocery store shelves. I believe I baked over 500 cookies last winter. This year, I will send one lucky reader a few dozen of deliciously tasty holiday treats. All you need to do is comment here on Blind Mom in the Burbs or on my Facebook page with your favorite holiday treat, double points if you have a recipe to share. I will select the winner on Saturday November 22,(one week from today), and you will have them just in time for Thanks Giving. So yummy! Back when I used to bake, I made an eggnog thumbprint cookie. It was a big hit. My all time favorite holiday food is GINGERBREAD. I’m obsessed with it, and don’t feel like it’s Christmas till I have a gingerbread bellyache. Looks yummy for my tummy. Here is a recipe for Salted Caramel Pecan Bars. 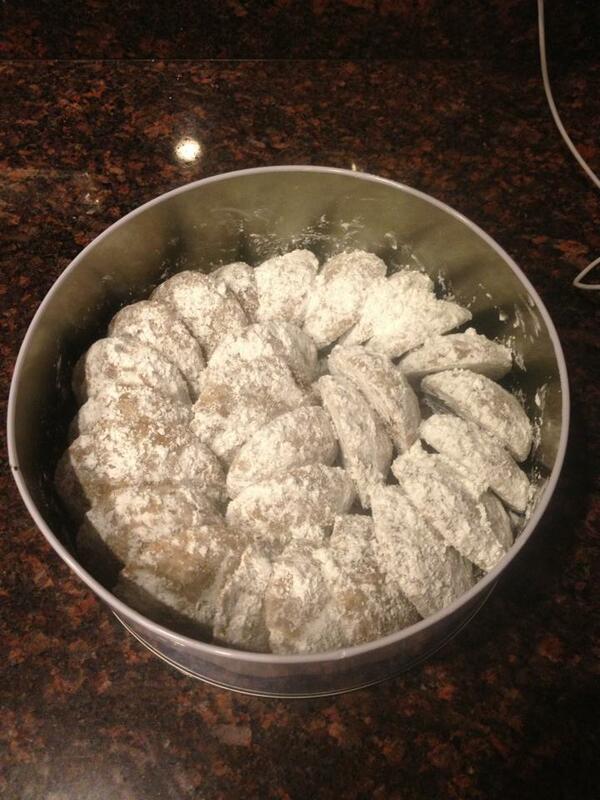 My family waits all year for me to make these. 1.Preheat oven to 350F. Line an 8-by-8-inch baking pan with aluminum foil, spray with cooking spray; set aside. I strongly urge lining the pan with foil for easier cleanup. 2.Crust – In a large bowl, combine all crust ingredients and using two forks or your hands (I find hands easier), cut butter into dry ingredients until evenly distributed and pea-sized lumps and sandy bits form. The softer the butter is, the quicker and easier it is. 3.Turn mixture out into prepared pan and pack down firmly with a spatula or hands to create an even, uniform, flat crust layer. 4.Filling – Evenly sprinkle the pecans. 5.Evenly sprinkle with the chocolate chips; set pan aside. 6.In a large, microwave-safe bowl, combine 1/2 cup butter, brown sugar, whipping cream, and heat on high power for 1 minute to melt. 7.Remove bowl from micro, and whisk until mixture is smooth; it’s okay if butter hasn’t completely melted. 8.Return bowl to microwave and heat for 1 minute on high power. 9.Remove bowl from micro, and whisk until mixture is smooth. 10.Whisk in the vanilla and salt. 11.Slowly and evenly pour the caramel sauce over the chocolate chips and pecans. 12.Place pan on a cookie sheet (as insurance against overflow) and bake for about 30 to 32 minutes, or until caramel is bubbling vigorously around edges, with bubbling to a lesser degree in center. Allow bars to cool in pan on a wire rack for at least 3 hours, or overnight (cover with a piece of foil and/or put pan inside large Ziplock), before slicing and serving. Bars will keep airtight at room temperature for up to 1 week, or in the freezer for up to 6 months. Yum! I can’t wait to try this recipe. Terri, My favorite apple pie recipe is a little different but a great seasonal treat. It goes great with hot apple cider as well! Combine the sugar, cinnamon and mix with the apples. Put this in the pastry shell. Top with chocolate chips. In small bowl, combine bisquick and sugar. Cut in butter until mixture resembles coarse meal. Sprinkle evenly over the pie. Bake at 400 degrees for 45 minutes. This sounds amazing. I’ll definitely be trying this recipe. Thanks.